Copyright 2015, 2016 All rights reserved. Bulge in bottom of lower vertebra is probably from injury. 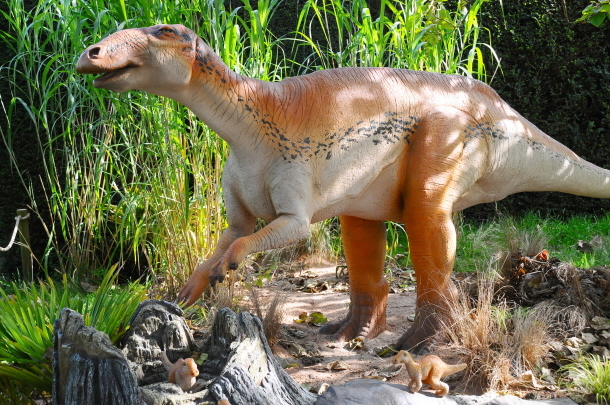 Edmontosaurus annectens is a duck-billed dinosaur that travelled normally on four legs but could walk on two legs for short distances. It was a herbivore with a beak and teeth in batteries further back in the mouth. Their teeth were complex composed of six types of tissues. They grew to about 42 feet long and 10 feet tall at their hips. Fossilized imprints of Edmontosaurus mummified skin were recovered in Wyoming showing the various scale patterns on different parts of their extremities.